Note that a Variac does not provide line isolation, for which you must not connect grounded equipment or an oscilloscope! T1 can be replaced with a fixed-voltage transformer for line isolation. The lugs bracketed in the schematic as "control panel" are the connection point from the power supplies to the switches and coilgun. 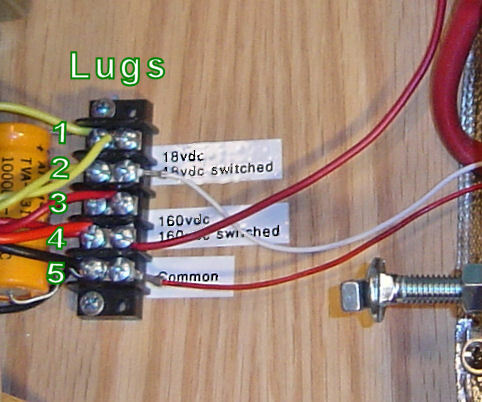 The lugs have advantages over soldered connections. They simplify testing, provide connection points for meters, and allow easy replacement of a power source. For example, an 18v battery pack with 160v inverter could replace the transformers with the simple use of a screwdriver. The lugs are numbered 1 through 5 from top to bottom, as shown in this photograph.